On 3rd June 2012 about 1545 hours, 5N-RAM, a Boeing MD-83, a domestic scheduled commercial flight, operated by Dana Airlines Limited as flight 992 (DAN 992), crashed into a densely populated area during a forced landing following a total loss of power in both engines while on approach to Muhammed Murtala Airport (LOS), Lagos, Nigeria. Visual meteorological conditions prevailed at the time and the airplane was on an instrument flight plan. All of the 153 persons aboard the airplane, including the 6 crew members were fatally injured. There were 10 confirmed ground fatalities. The airplane was destroyed. There was post impact fire. The flight originated at Abuja (ABV) and the destination was LOS. The airplane was on the fourth flight segment of the day, consisting of two round-trips between Lagos and Abuja. The accident occurred during the return leg of the second trip. DAN 992 was on final approach for runway 18R at LOS when the crew reported the total loss of power. 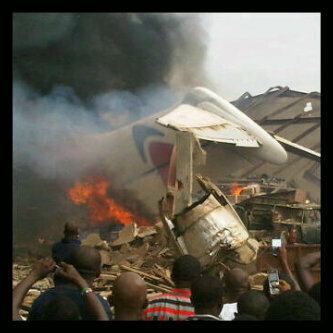 According to interviews, the flight arrived in ABV as Dana Air flight 993 about 1350. According to Dana Air ground personnel, routine turn-around activities occurred, including refueling of the airplane. DAN 992 initiated engine startup at 1436, taxied to the runway and was later airborne at 1458 after the flight had reported that it had a fuel endurance of 3.5 hours. Shortly after takeoff, DAN 992 reported 1545 as the estimated time of arrival at LOS as the flight climbed to a cruise altitude of 26,000 ft. DAN0992 made contact with Lagos Area Control Center at 1518 hours. The cockpit voice recorder (CVR) retained about 31 minutes of the flight and starts about 1515 at which time the captain and first officer were in a discussion of a non-normal condition regarding the correlation between the engine throttle setting and an engine power indication. However, they did not voice concerns then that the condition would affect the continuation of the flight. The flight crew continued to monitor the condition and became increasingly concerned as the flight transition through the initial descent from cruise altitude at 1522 and the subsequent approach phase. DAN 992 reported passing through 18,100 and 7,700 ft, respectively, at 1530 and 1540 hours. After receiving a series of heading and altitude assignments from the controller, DAN 992 was issued the final heading to intercept the final approach course for runway 18R. During the period of 1537 and 15:41 the flight crew engaged in pre-landing tasks including deployment of the slats, and extension of the flaps and landing gear. At 15:41:16 the first officer (FO) inquired, "both engines coming up?" and the captain (Capt) replied “negative.” The flight crew subsequently discussed and agreed to declare an emergency. At 1542:10, DANA 992 radioed an emergency distress call indicating "dual engine failure . . . negative response from throttle." At 1542:35, the flight crew lowered the flaps further and continued with the approach and discussed landing alternatively on runway 18L. At 1542:45, the Capt reported the runway in sight and instructed the FO to raise the flaps up and 4 seconds later to raise the landing gear. At 1543:27 hours, the Capt informed the FO "we just lost everything, we lost an engine. I lost bothengines". During the next 25 seconds until the end of the CVR recording, the flight crew was attempting to restart the engines. The airplane crashed in a residential area about 5.8 miles north of LOS. The airplane wreckage was on approximately the extended centerline of runway 18R. During the impact sequence, the airplane struck an incomplete building, two trees and three buildings. The wreckage was confined, with the separated tail section and engines located at the beginning of the debris field. The airplane was mostly consumed by post crash fire. The tail section, both engines and portions of both wings, representing only about 15% of the airplane were recovered from the accident site for further examination. The two flight recorders, the Cockpit Voice Recorder (CVR) and the flight data recorder (FDR) were analysed at the facilities of the National Transportation Safety Board (NTSB), Washington, D.C., USA. The solid state based memory in the CVR was in good condition and retained 31 minutes of audio information. The digital tape based memory in the FDR succumbed to the post crash fire and melted, consequently no data could be recovered. The captain, age 55, held an airline transport pilot license with type ratings in the A-320, DC-9, FK-28, and SF-340. He had over 18,116 hours of total time, including 16,416 hours of pilot-in-command time (PIC). The captain had 7,461 hours in the accident model airplane all of which was as PIC. He was employed with Dana Air on 14 March 2012. He began flying line operations for the company in late May 2012 and had since accrued over 120 hours of flight time. The captain had acquired about 3, 78, and 116 flight hours, respectively, in the preceding 24 hours, 30 and 90 days. The first officer, age 34, held a commercial pilot license he was type rated in MD-83. He had 1,143 hours of total time, including about 200 hours as pilot-in-command. The first officer had 808 hours in the accident model airplane all of which was second-in-command. He had been previously employed with Dana Air as the Director of Cabin Service before he was hired as a pilot about January 2011. The first officer had accrued about 3, 42, and 154 flight hours, respectively, during the preceding 24 hours, 30 and 90 days. The airplane was manufactured in 1990 and according to maintenance records it had accumulated 60,846 hours (35,219 cycles) of total time. The left and right engines respectively had 54,322 (30,933 cycles) and 26,025 (12,466 cycles) hours of total time since new. A review of the aircraft technical logs did not reveal of the previous 30 days did not indicate a condition. The airplane had last undergone maintenance on 1st June 2012, and after a return to service flight on 2nd June 2012, it was operated on four revenue flights (two round trips between LOS and ABV) and another four flights on 3rd June 2012. Fueling records indicated the airplane was uplifted with 8000 lbs of fuel before departure from ABV. The flight crew reported to ATC they had 26,000 lbs of total fuel. Preliminary analysis of fuel samples from the refueling truck and the supply tank at ABV were negative for contamination. The investigative activities have included, in part, visual examination of the aircraft wreckage, review of maintenance records and other historical information of the aircraft, documentation of the training and experience of the flight crew, determination the chronology of the flight, review of recorded data, reconstructing the aircraft refueling, and collection of related fuel samples, and interviews of relevant personnel. Future investigative activities will include, but is not limited to, the detailed examination of the engines, further testing of fuel samples, continued factual gathering of relevant historical, operational, maintenance and performance information of the accident airplane in addition to other similar airplane models, further development of the background of the flightcrew, further analysis of the CVR audio recording and review of pertinent issues associated with regulatory oversight. As the State of Occurrence, the Accident Investigation Bureau (AIB) has instituted an investigation in accordance with the standards and recommendations specified in the provisions of Annex 13 of the International Civil Aviation Organization. As the State of manufacture of the airplane and engine, a US Accredited Representative has been appointed and assisted by US technical advisors from the NTSB, US Federal Aviation Administration, Boeing Airplane Company, and Pratt & Whitney Engines. In accordance with Annex 13, "the sole objective of the investigation of an accident or incident shall be the prevention of accidents and incidents. It is not for the purpose of this activity to apportion blame or liability." Accordingly, the AIB with the participation of the parties, including the NCAA, will seek to identify any areas of safety concerns during the investigation and implement the appropriate actions for correction or improvement. The content of this report is based on preliminary information. The Bureau will continue to conduct the investigation in a meticulous and methodical manner and release facts as they become validated.